When I was in high school, the movie Top Gun came out. If you’ve seen the film, you know it’s a flashy and adrenaline-fueled depiction of U.S. Navy fighter pilots training to be the “best of the best” at an elite flight school. Not only was it spectacularly successful in terms of the box office, but the Navy stated that the number of people joining to become fighter pilots rose an astonishing 500 percent during the year after the film came out. I will admit to having fantasies along those lines myself, until I learned that fighter pilots needed outstanding natural eyesight and skill in mathematics and physics. So that was the end of my fighter pilot dreams! Recently, though, I watched a documentary depicting daily life on a U.S. aircraft carrier. Some of the scenes were quite familiar: the fighter pilots competing over who was the best as they achieved jaw-dropping feats in the sky; the intense action on a carrier deck when planes are either being catapulted into the sky or brought to a screeching stop by cables when they land; and so on. But what was really interesting was, unlike Top Gun, the extraordinarily complex and demanding systems of machinery, personnel, and technology required to run a carrier so that those pilots can do their amazing work in the air. Think what it would take to make breakfast for 1500 sailors at the same time on a boat far out in the ocean! Or how many people and how much effort simply to clean the bathrooms and hallways of a boat as long as the Empire State Building is tall! When we think of aircraft carriers, we usually think along the lines of Top Gun, but without the people to perform those relatively invisible tasks and countless others, the pilots would be stuck. 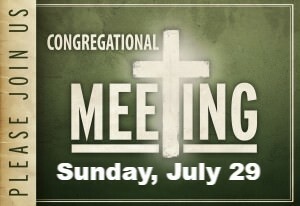 This week, after our Congregational Meeting in the Sanctuary immediately following the 10:30 am service, we will hold a Town Hall meeting to provide our documentary glimpse into something of the range and fullness of the work we are accomplishing together so that First Presbyterian Church of Bethlehem can continue its sail forward toward its own mission: to proclaim and live out the good news of the gospel in everything we do. Some of those things will be familiar; some will be the relatively invisible but crucially important tasks that keep everything running. And then it will be your turn. What do you want to hear about? What questions, concerns, or celebrations do you want to lift up as we consider where we’ve been over the last six months and where we’re going? Come this Sunday and be a part of the story! Hope to see you there.